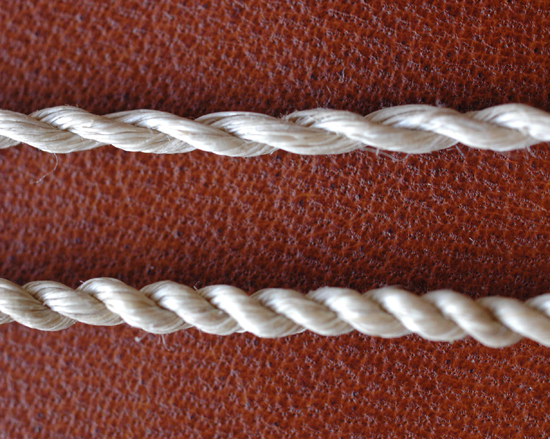 Almost everyone who already makes cordage is familiar with the hand twisting method, often called reverse wrapping, where the twists in a cord are made one at a time. Reverse wrapping is useful at times, good to know, and a good way to learn about cordage, but it is pretty slow going! We also use a method I came up with which we call mouth twisting (or I think that’s what we call it. It’s kind of a dumb name). Mouth twisting is a little faster than reverse wrapping, but it is not as fast at leg rolling, and it can make you cross eyed, looking down at the cordage right in front of your nose, so it’s not very pleasant work, though I still use it quite a bit for certain applications. Tightness of twist: Many years ago, I made a batch of slings, the kind for throwing rocks, with buckskin pouches and dogbane cords. Having a disease somewhat approaching perfectionism at the time, I wanted to make those strings super duper nice and tight! I used the mouth twisting method, which can be used to make very tightly twisted cord. I figured that if the cords where under great stress and possibly some twisting and untwisting action while the sling was in use, I’d better make them really “good”. I was used to making necklace cords this way and they lasted a long time. So I made them SOOOO NICE! The were thick, immaculately spliced with no tag ends and the fiber added very gradually so there were no weak spots. And boy were those suckers tight. They were perfect(ish), looked great and the strings broke when they were used. I was like wahhhh!?!?!??? The strings were so tight it turned out, that the fibers were not able to move freely and were basically cutting each other when under stress. I had another sling which I’d made with much thinner looser dogbane cord and a coyote scalp pouch, which never did break in spite of considerable use. Top: Leg rolled Agave cordage of probably average tightness. Below: mouth twisted cordage of mad stupid tightness! Follow the fibers in each with your eyes and you can see how different the angles are. Imagine pulling on each one. the leg rolled cord is going to experience mostly tensile pressure, end to end, and not that much shearing pressure. When the very tight cord is pulled, it will try to stretch out, and in so doing, it has to turn a lot of corners and the fibers will experience shearing forces as they push ever tighter and harder against each other. Not a big deal if you are making a necklace, but certainly an issue if you are making a bow string. I don’t have time to turn this into a how to novelette on leg rolling, but I was just working on the Paleotechnics cordage book. I made up a new batch of pine soot ink to do book illustrations, of which there will be many in that book. Said book has been in progress, or languishing in a corner of my computer for many years, so no saying when it will actually be finished. It’ll be good when it is finished though, promise! Leg rolling is still best learned in person. 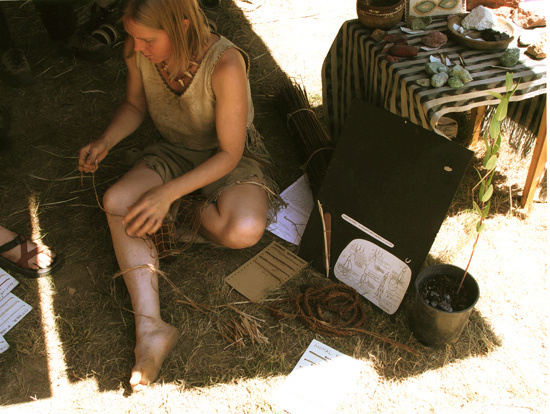 Fire, cordage and stone tools, along with knowledge of the plants and materials used to make them, form the foundation of basic technology. If you have a chance to learn leg rolling in person at an event, or from a friend, do it. Once you know how to do something, no one can take that away from you, and this is a skill that has been pandemic to our human family for good reason. Finally, it’s one thing to know how to leg roll cordage, but to get really good at leg rolling, the best approach is to undertake a large project that requires 50 feet or more of cordage. Then you’ll be rolling out cordage like a spider. wow. pretty informative article for not telling how to do it !! !